Binary Viewer is absolutely free. If you find a bug we will try to correct it as soon as possible. If you have an idea how to improve it, we will try to implement it. However development efforts needed to develop and extend program functionality are significant. If you like the program, if you want it to grow in functionality, if you want it to be supported at the current level please consider donation. We don't suggest any amount. Even single dollar counts but we know that for some people dollar might be too much. We hope your quest is over: you found the tool you were looking for. 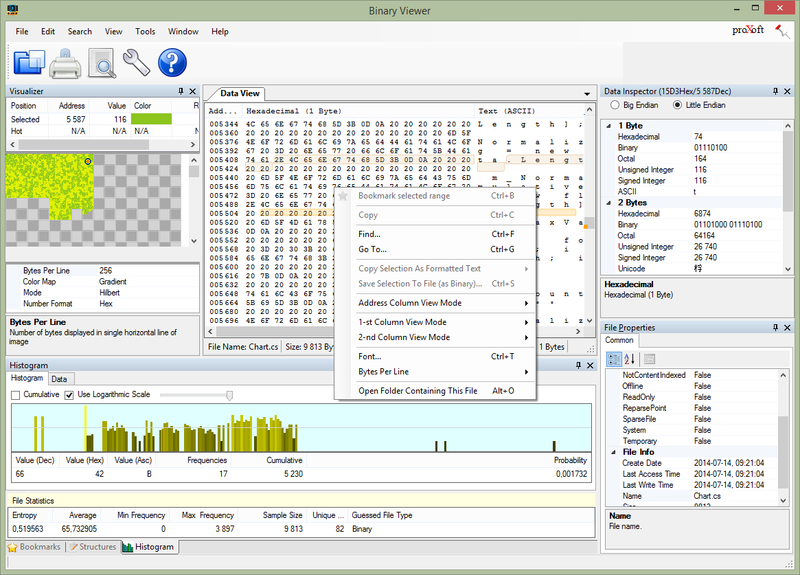 In few words: Binary Viewer is a free windows utility that you to open and view any file located on your computer regardless of format file was saved. But in fact it is much more. Binary Viewer can display file contents in binary, hexadecimal, octal, decimal and text formats (multiple Encodings), therefore letting you to peek into binary files, usually not viewable when using standard Windows viewer/editors like Notepad, Word, Excel and others. Files are usually used to persist data and are intended to be interpreted by the different programs. Files can contain programs itself. In most cases computer files are interpreted by programs or operation system in proper manner: program files are executed, data files are loaded by programs and rendered, turned to images, sounds, spreadsheets of data. This works well, that how computers are build for, but if you want to see what's happening under the hood, if you want to know how exactly looks the file Audio Player turns into beautiful music or how Audio Player insides looks like, you got 'Binary Viewer'. Besides ability to see contents of the file bytes in convenient format, 'Binary Viewer' offers host of options allowing to see file content in graphical format, file statistical analysis and cryptographic file utilities. Got an Idea? Want to help? We want to make 'Binary Viewer' your ultimate and the only one application of this type on your desktop. If you don't see functionality you think is essential to your needs, please let us know . A lot of functionality of 'Binary Viewer' is user driven. You ask, we listen and very often your suggestion is implemented in short time, benefiting you and other users as well. So don't hesitate - if you have an idea to improve the program - let us know. 'Binary Viewer' GUI supports multiple languages. Currently program can display English, Chinese, Italian and Polish interfaces. If you want to volunteer and provide translation to another language please contact us as well. We will give you all information you need to translate the program. (¹)Thanks to using memory mapped files, only small portion of viewed file is residing in RAM. (²)NO ADWARE, NO SPYWARE, no hidden "features". If your security settings don't allow downloading executable files you can download zipped version of Binary Viewer setup. It is setup of the same latest version of the program. Here you can download portable distribution. After downloading you need to unzip it and copy to any location of your choice. It can be even memory card for greatest portability. If you want to access features not yet available in main release you can download Beta version of the next software release. Please be aware: this is beta version, not fully tested and might be less stable than production release.